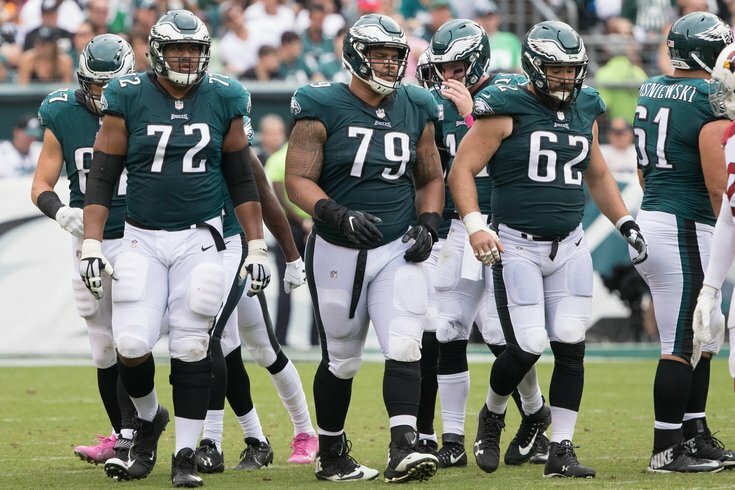 The Eagles have unspoken communication advantages on their offensive line that many other teams don't have. Offensive line continuity is widely accepted as a desirable thing for any offense to possess. The longer five players along the offensive line play together, the better they become at communication, as well as knowing what each of the other players along the line are going to do in various situations. Offensive line continuity is typically discussed conceptually, as opposed to tangibly, as the concept of "continuity" is difficult to highlight on game film. That continuity is a major advantage, according to Eagles offensive line coach Jeff Stoutland. "I remember last year, early in camp, we weren’t hitting things correctly," said Stoutland. "We were just off a little bit. I kept telling everybody, ‘It takes (time) to get these things perfect.’ As the season went on, I could see all the little things coming together. That last game, it was like synchronized swimming. It was in such sync. "There were things that happened in that Super Bowl – some were conversion calls – that were made that were unbelievable. There was a long run that LeGarrette Blount had that went off to the right side. Kelce made one of our conversion calls. They were misaligned at first, and then the linebacker came over really late in the cadence, and he pulled a conversion call out and we popped a run because the front was slanting and angling, and it was a beauty. It was a beautiful thing to see. The result was exactly what you would expect when you pull something like that off." The play in question was a 36 yard rumble by Blount that set up the Eagles' first touchdown of the night, a 34 yard pass to Alshon Jeffery. When the play is viewed from the All-22 angle with no explanation, it doesn't look like much from the offensive line's perspective. Some guys blocked, the running back ran through the hole, Nigel Bradham went berserk on the sidelines, and 'Yay, go team,' right? Well, there was more to it than that. "It’s a typical blitz, or at least that’s what we were expecting," said Kelce. "We kinda thought it was going to be a blitz including just the NT and the linebacker. I made a conversion call to kind of 'full zone' the back side of it. I bring the guard (#61 LG Stefen Wisniewski) with me so that he can collect the NT and I can go through for the backer." Here's a look at how Kelce envisioned the Eagles' blocking assignments, pre-snap. LT Halapoulivaati Vaitai would block down on the RDE (#90 Malcom Brown). RG Brandon Brooks would block the LDE (#55 Eric Lee). RT Lane Johnson would block the OLB (#92 James Harrison). C Kelce would cross the face of the NT (#93 Lawrence Guy), forcing Guy toward Wisniewski, who was coming over from his LG spot to block him. Kelce would then head up field to block the linebacker (#53 Kyle Van Noy). However, the Patriots were scraping with their linebacker through the B gap instead of the A gap, which caused a problem for the call the Eagles were in. "They did an extra wrinkle," said Kelce, "and this is why Belichick is so smart. He just went one further, to have the backer (#53, Van Noy, red arrow) go around the 3-technique (#55 Lee), and the 3-technique (Lee, yellow arrow) spiked down." Kelce would not have been able to get to Van Noy (53), and with Brooks picking up Lee (55), Van Noy would have had a clear path to the backfield through the B gap (the gap in between the RT, Johnson, and the RG, Brooks). "Brandon kind of realized what was happening," Kelce explained, "and after I moved, I kind of saw the path of the backer." At this point in the play, the most effective way to block it up would be for Kelce to forget about the blitzing linebacker (#53 Van Noy) and instead block the LDE (#55 Lee). Meanwhile, the Eagles would be best served for Brooks to do the opposite. He should abandon Lee and go block Van Noy. However, for Brooks to leave his assignment, he had to quickly decide whether or not Kelce would be adjusting on the fly as well. Brooks did indeed leave his assignment to pick up the blitzer, Kelce picked up Brooks' man, and the Eagles had "hat on hat." The result was a nice hole for Blount. "I saw (the backer) coming around wide," said Brooks. "Kelce is an extremely smart player, and he's been doing it at a high level for a very long time. That's something we just call 'blind faith,' and what I mean by that is you know what's going on, he knows what's going on, and you react. It's not exactly how you drew it up, but you react because you practiced it so many times." "All of that is just kind of trust," said Kelce. "It's stuff that kind of happens outside the realm of the typical rules for any given play or call. That's just stuff that happens through repetition with guys, and being familiar with the offense, and how you want to block defenses." It doesn't look like much, but as Brooks pointed out, that on-the-fly adjustment was "the difference between the play popping out, or not." That's the value in continuity. Stoutland summed it up. "In a second, like that (snaps fingers), for all five guys to get in and be on the correct angle, and get up to the right linebacker, that was pretty special."